At the conclusion of the Final Chapter story arc, Norman was carted off to Bellevue where he was unmasked by a group of guards and doctors. Fortunately for Norman, his secret ID as the Green Goblin remained intact due to a small group of loyal Scriers who attacked and killed the Bellevue attendants that did the unmasking. 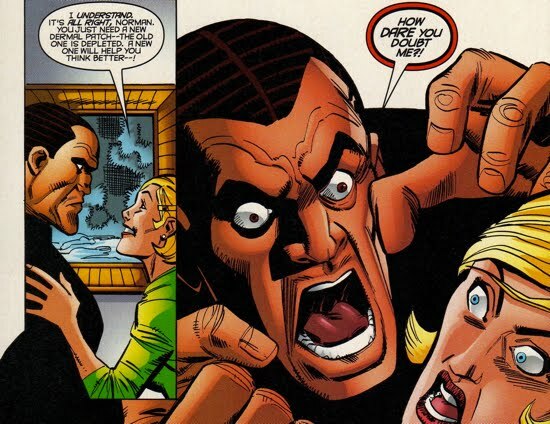 The insane Norman Osborn was now back in the care of his loyal cabal, allowing the super villain to plot revenge once again on his arch nemesis Spider-Man. Osborn’s battle with the "gift of madness" as well as his return, yet again, to the Spiderverse are both featured in a five part story arc that weaves through the mini-series Revenge of the Green Goblin and the two main titles Amazing Spider-Man and Peter Parker Spider-Man. This arc presents a very unique plot by Norman against Peter as he tries to force Peter into becoming his heir to the Goblin legacy. After the Scriers carted off Norman at the conclusion of Peter Parker Spider-Man #98, they brought him to a safe house so that he could regain his sanity privately. Revenge of the Green Goblin #1 opens with Norman reviewing video footage of his latest battle with Spider-Man. His recollection of the events and the actual occurrences are at odds with each other, due to his insanity, and he is struggling to discern fact from fiction. Donald Menken, a long time employee of Osborn Industries and personal confidante of Osborn, is by Norman's side at the safe house. It is revealed that Menken was one of the Scriers that stole Norman out of Bellevue. At the safe house, Norman is dependent upon a cocktail of drugs, formulated by his private physician Dr. Albert Bendix, to maintain his shaky grip on reality. Norman's nurse, Kolina Frederickson, is introduced as well and it appears as though Norman is very attracted to her, as she reminds him of his deceased wife Emily. 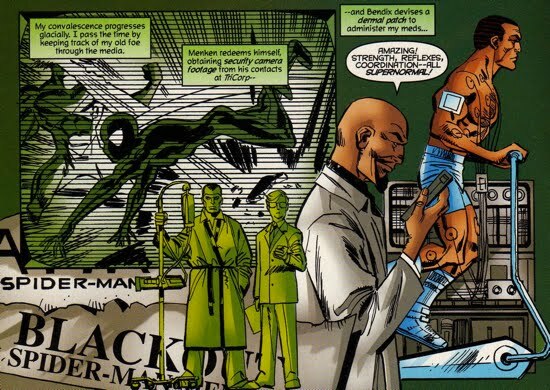 As time goes by, Norman's mental health begins to show signs of improvement and he continues to keep tabs on Spider-Man through the Daily Bugle. When MJ "dies" in a plane crash, Norman realizes that the time for his revenge on Peter is near. Soon after, Norman returns to his estate along with Kolina, who is now his full time private-duty nurse. While at his estate, Norman initiates a romance with Kolina, claiming that she brings a balance to his life much in the same way Emily had. But Norman has not forgotten about his plot and Peter, as he prepares to meddle in his life once again. 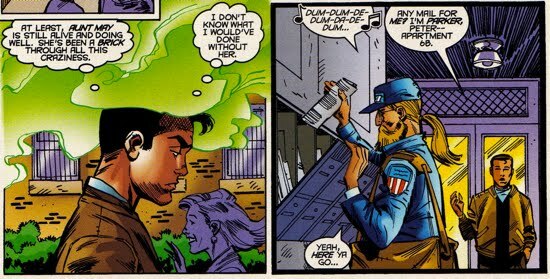 He was able to get close to Peter without setting off his Spider-Sense by exposing him to the same gas that dampened his Spider-Sense in Amazing Spider-Man #39. Peter unknowingly walked right through it on his walk home and then stopped to get his mail. Osborn disguised himself as his mailman and delivered a "free" sample of toothpaste to Peter. The toothpaste was laced with a hallucinogen and specially designed RNA compounds, which he planned to use in order to manipulate Parker. 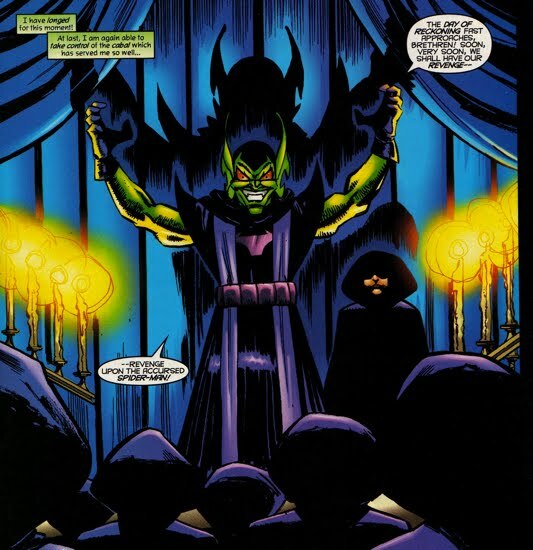 In Revenge of the Green Goblin #2, Norman dissolves his relationship with the Scriers, taking only his loyal following with him to initiate his new cabal which he calls The Order of the Goblin. This faithful group of Osborn-enthusiasts refer to the leader as The Goblin-Lord. 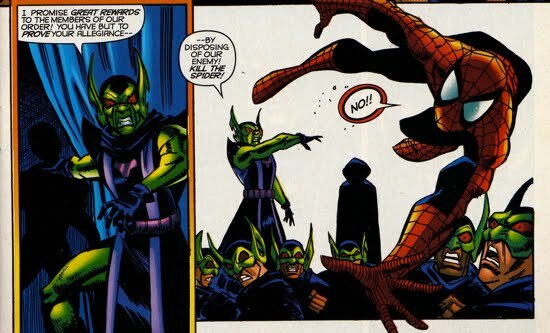 As a very quick aside, its worth mentioning that this group of loyalists is well aware of the Green Goblin's civilian identity, Norman Osborn, as well as his personal war with Spider-Man. Meanwhile, Peter begins experiencing Goblin-related delusions while brushing his teeth, Peter believes that he is just having nightmares and is unaware of Norman's plot against him. Back at Norman's estate, Kolina and Norman begin to bond a bit more when she interrupts him in his study. Norman proceeds to tell her some of the details around his family history, which is outlined more thoroughly in the Norman's Heritage section of this site. When Peter visits his Aunt May, she tells him that his Uncle Ben was once part of musical trio and that the grandson of one of the members of that trio sent her a CD with some of their music. Peter tells his aunt he'll copy it onto a tape for her, before he does that, he listens to the tape himself. The music induces another delusion for Peter, and it turns out that Osborn had mailed that CD to May as part of his plan. The second chapter in this arc ends when Kolina inadvertently surprises Norman in his underground lair while he is fully dressed in his Goblin garb. Norman, who is completely caught off guard, hurls a pumpkin bomb at the intruder, not realizing it was Kolina. A distraught Osborn holds his private nurse in his arms as he weeps of the possibility of having killed her. While Norman laments over the potential loss of Kolina, his seige on Peter's life is working flawlessly. In Amazing Spider-Man V2 #23 and Amazing Spider-Man V2 #24 Peter is exhausted as he claims that he 'can't get enough sleep' while having dreams involving both the Green Goblin and Gwen Stacy. 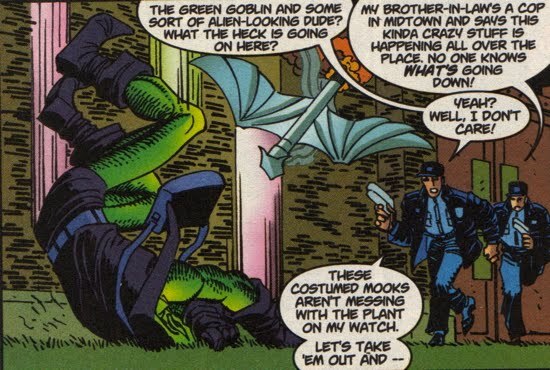 Unbeknownst to Peter (and the reader to at this point), when he falls asleep he begins sleepwalking (for lack of a better term) and performs the Goblin's bidding while in the guise of the Green Goblin. The next morning Pete would awake feeling worse than when he had gone to sleep, he remains very confused as to what is going on. This subplot is ultimately explained as the Goblin Heir story arc progresses. 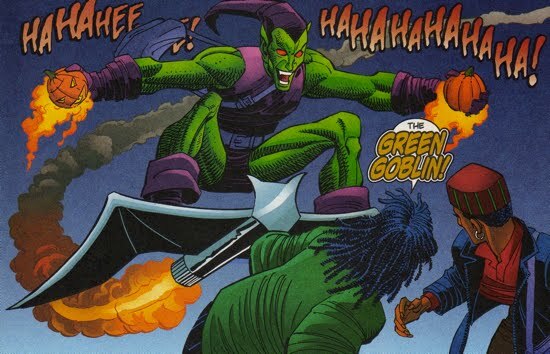 The third and final issue of the Revenge of the Green Goblin mini series begins with another Goblin-induced delusion experienced by Peter, but this time he is not alone. His roommate, Randy Robertson, is experiencing them as well which puzzles Peter. 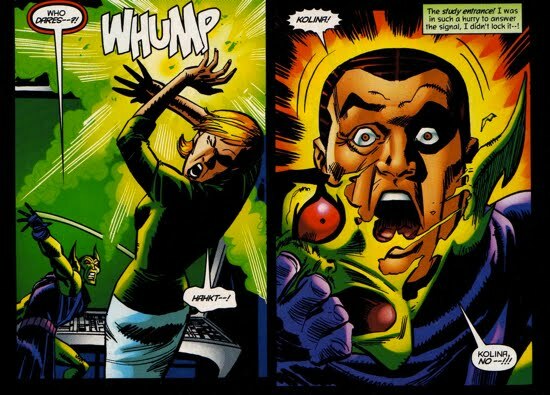 Returning to the Osborn estate, we see that the pumpkin bomb blast that Kolina experienced in the previous issue did not kill her and when she eventually returns to consciousness she is greeted by Norman at her bedside. Norman confesses to being the villainous Green Goblin and later he shares more of his history as the Goblin with Kolina as well. Meanwhile, the body of Dr. Bendix is found dead and dressed in a Spider-Man costume, however, the authorities are convinced that this is not the real Spider-Man. 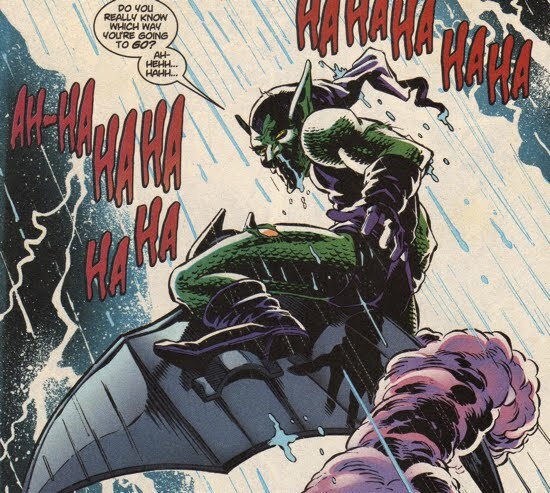 An eyewitness has identified the Green Goblin as the person who dumped the body into the river. Peter arrives on the crime scene for the Daily Bugle, and begins to notice a correlation between his delusions and the murder of Dr. Bendix. 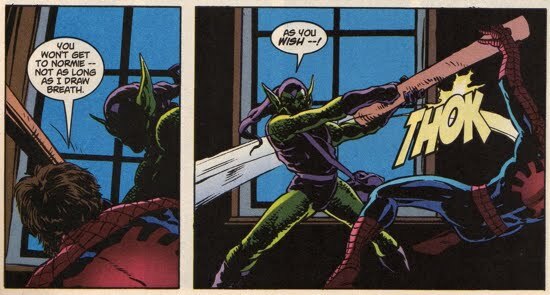 Some of Peter's delusions involved the Green Goblin throwing Spider-Man from the Brooklyn Bridge, but he had dismissed it as a memory of Gwen's death. 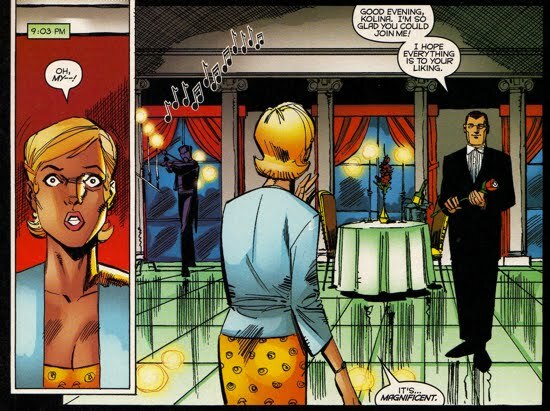 Back at Osborn's mansion, the conversation between Norman and Kolina regarding his past causes Norman to lose control of his temper as he lashes out at her. Menken then pulls a gun on Kolina, in an effort to "help" Norman but this causes Norman to attack Menken. He strangles Donald mercilessly while Kolina tries to stop him, as Menken is being choked he utters, "But I'm y'r heir…"
Norman begins to calm down when Kolina places another dermal patch (method for administering his medication) and he commands his underlings to take Donald and Kolina to his Adirondack estate. When they leave, Norman comments to himself that Menken could never be his heir and Norman's true intentions for his latest torment of Peter Parker begin to be revealed. 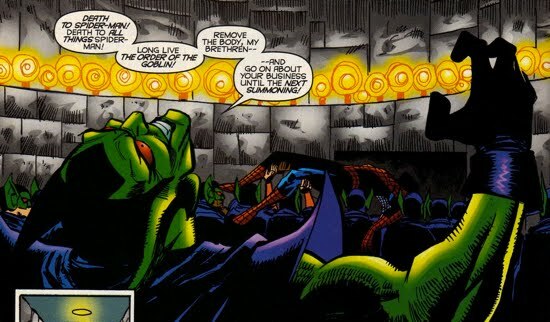 Osborn has been able to essentially brainwash Peter (with the chemicals in the toothpaste and the subliminal messages on the CD's) to don the Goblin costume and carry out Norman's bidding without Peter ever being aware of what he is doing. This is all being to done to have Peter embrace Norman's "way of thinking" and become his chosen Goblin heir. The Goblin Heir plot continues in Amazing Spider-Man V2 #25 as Norman, while gazing upon the Osborn estate, reminisces over his childhood and his father forcing him to "face the darkness". This dynamic is explored further in the Norman's Childhood section. 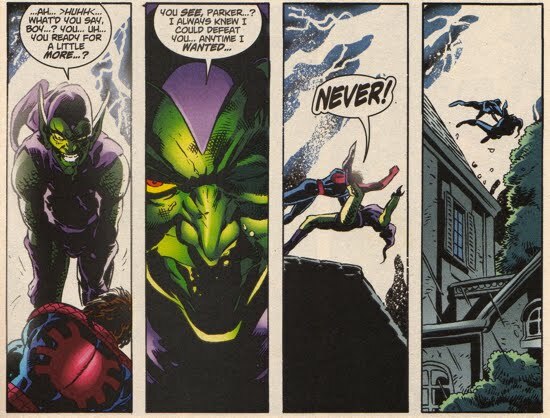 Meanwhile, the Green Goblin (an unknowing Peter Parker) continues to terrorize Peter's friends, nearly killing Randy Robertson and Glory Grant. The Goblin goes on to partially destroy the Daily Bugle offices once again searching for Spider-Man. Peter wakes up in his apartment thinking that he just experienced a frightening dream, but he's beginning to suspect that the Green Goblin is back and is behind all this. As Spider-Man he visits Liz and Normie Osborn to see if they have seen or heard from Norman. Normie claims that his grandfather visits him at times and that he (Norman) knows where his daddy (Harry) is. Norman is watching the whole discussion from a distance with binoculars. Peter returns to Aunt May's home where he eats and gets some rest, but he is quickly awoken by a fire at the Stacy house which the Green Goblin (a brainwashed Peter Parker) had caused. Peter, as Spider-Man now, rushes in the house to save Paul Stacy, who was booby-trapped with a pumpkin bomb. Peter returns home after saving Paul and finds multiple messages on his voice mail that suggest the Green Goblin is on a rampage, he realizes a confrontation with Norman is imminent. 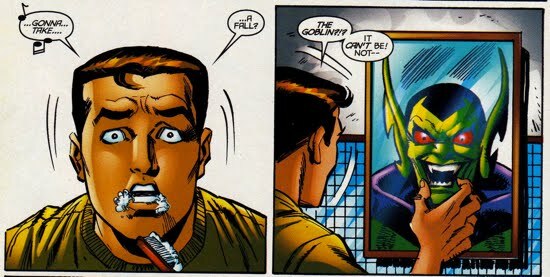 Peter resolves to go after Norman, but before he does he makes the connection between the tooth paste and the delusions just as he is brushing his teeth. It's too late though, he passes out again and when he wakes up he is in the grip of Norman Osborn. Osborn tells Peter that he is going to make him face the darkness the way he had when he was a child. Soon after, the Green Goblin (most likely Peter once again) abducts Normie Osborn through his bedroom window. As Peter wrestles with Norman's mental torments involving the "darkness", Norman finally drops the hammer. He tells Peter that it was he (Peter) in the Goblin attire doing the terrorizing and that he is going to now force Peter to "Be a man. Be an Osborn." The fifth book and final book of this arc is Peter Parker Spider-Man V2 #25 which features a...Peter Parker funeral? Well, it’s another delusion, Peter is in the Osborn estate along with Norman who is manipulating the vulnerable Parker into "accepting the change going on inside him" (sounds a little creepy...). Norman informs Peter that the hallucinogen that he had previously exposed Peter to had traces of the Goblin Formula in it in order to "open his eyes to the potential." Showing a softer side of himself, Norman then shares his traumatic childhood experiences with Peter, experiences aimed at toughening up the young Osborn (once again see the Norman's Childhood section for more information). Norman continues to open up to Peter and he tells him that he realized Peter was the rightful heir to the Osborn name when he (Norman) returned to New York to see his grandson Normie soon after he was born. According to Norman, he took a break from his exile in Europe to check in on his family at the hospital and saw that Peter was secretly visiting as well. Witnessing Peter keep a watchful eye on Norman's family touched Norman and the incident gave him a newfound respect for Peter. Although this newfound respect did not stop Norman from constantly meddling in Peter's life and wreaking havoc, of course. For more on the birth of Normie Osborn see the Harry Osborn section. Additionally, in the one shot Spider-Man: The Osborn Journal, Norman notes that it was Spider-Man who saved young Normie from the potential exposure to a toxic version of the Goblin Formula. 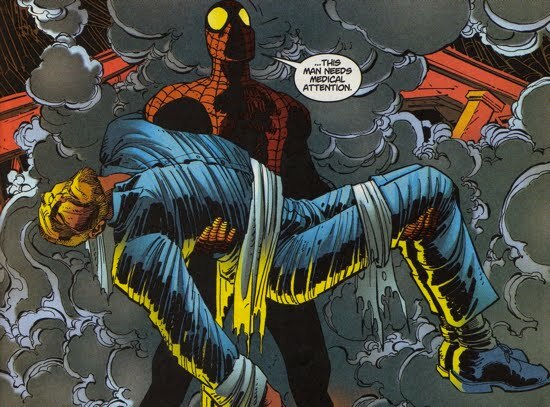 Peter's rescuing of Normie occurred in the one-shot Spider-Man: Legacy of Evil and Norman was aware of what Peter had done that day. Certainly that also helped to contribute to Norman's desire to have Peter Parker as an heir. Peter is continuously tortured by Osborn for what appears to be weeks as Norman tries to break Peter’s spirit and accept the darkness. Peter eventually overcomes the mind games and rejects both "accepting the darkness" and being the heir to the Osborn legacy. At the story's conclusion, Norman claims that he has won, because for a brief moment during the torture, Peter “blinked” at the darkness and that meant that Peter would no longer be able to maintain his altruistic façade. Garbed as the Green Goblin, Norman then takes off into the night cackling maniacally, thinking that he has finally bested his nemesis. Some points of interest concerning this story arc. 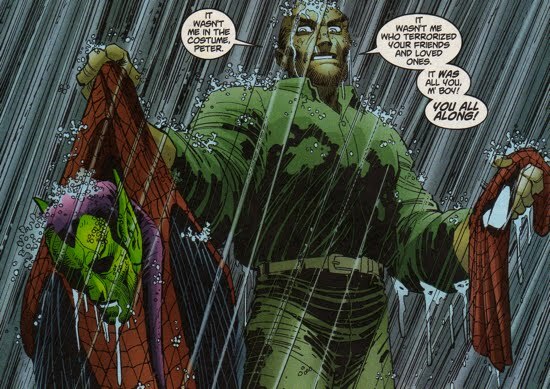 First, it appears as though the Normie abduction by the Green Goblin/Peter Parker plot was never resolved in this arc. Also, in light of Brand New Day Spider-Man (and thus Harry's return to the Spiderverse) this story arc takes on a different tone. With Norman aware that Harry is alive, forcing Peter to be his heir may be viewed as a tortuous mind game against Peter rather than an effort to truly convert him to be the Goblin heir.